The fate of the Nine-Nine is in peril. Captain Holt announces that the precinct is getting shut down, even though the actual hearing isn’t until later that evening. It’s between them and the Seven-Four, which has the distinct advantage of housing an elite gang taskforce. Jake hasn’t given up hope, though. He says as long as they can solve a huge case before the hearing, they’ll be saved. Unfortunately, no new cases are being filtered down to them from HQ and so the only open case they have left is a 10-year old whose bike was stolen. Jake and Boyle decide to give it their all anyway and ride out in matching leather jackets, driving the best undercover vehicle in the impound lot (a Mustang with a stripe down the middle). Meanwhile, Terry enlists Rosa’s help in breaking the record for the most solved cases so he can be crowned “Mr. Nine-Nine.” Terry currently ranks at number two behind – of all people – Hitchcock (who is just as surprised by this information as Rosa). Hitchcock may be dumb, but he’s been with the precinct for 20 years and as Terry says, the 80s for the Nine-Nine were basically like The Purge. Gina has other plans for her last day on the job: pranking all her coworkers by putting cement in their coffee and live-streaming it to her “G-hive.” While she carries out her potentially deadly day of pranks for the amusement of her fans, Amy stops by Captain Holt’s office, where she learns that he has been secretly mentoring her this whole time. There’s a binder and everything. Not wanting to lose out on Holt’s remaining wisdom, she encourages him to use their remaining 10 hours together to teach her everything he knows. Out on the streets, Boyle and Jake quickly track down the stolen bike. While arresting the man who was caught with the bike, they discover a huge stash of heroin in his backpack. This has officially turned into the big case that could save the Nine-Nine! The bike-stealing, heroin-toting man gives up his dealer — named “Dom” — who also supplies half the heroin in the city. This case just keeps getting bigger and bigger. Apparently Dom uses BMX riders for his drug deals. Jake tells Boyle he used to be a BMXer in his younger years and is sure he’s still got it. (He doesn’t still have it, but that doesn’t stop him.) When he meets up with Dom and his men to try to get in on the action, they’re dubious about his abilities and challenge him to a BMX race against one of the men. Unfortunately, Jake loses spectacularly. Fortunately, Boyle was able to sneak a GPS device onto the other racer’s bike when he passed him on their race route, and now they’ll know the location of Dom’s warehouse full of drugs. Back at the precinct, a man walks in to report his cell phone stolen. Terry sees this as his chance to beat Hitchcock’s record and instead of just filing a report, decides to track down the missing cell phone. The man would really prefer to just file the report and get a brand new phone from his insurance company, but Terry will hear none of it. Unfortunately, while Terry and Rosa race off to the bar where the man supposedly lost his phone, Hitchcock discovers the man’s phone wasn’t really stolen — the man broke it and lied so he could get a new phone. So, Hitchcock arrests him for filing a false police report, thus increasing his lead over Terry even more. Meanwhile, Amy has procured a stenograph and is diligently taking notes while Holt tells her all he knows, from the correct type of shirt collar to the only two acceptable sleeping positions to what people mean by various greetings. They finish their lessons with two hours left before the hearing. Amy’s mentorship with Holt is officially over, and Amy is terribly sad about it. 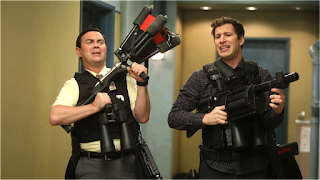 Jake and Boyle head back to the precinct to gather up a bunch of nifty gadgets to help them take down the heroin ring. While staking out Dom, they discover that he and his men are planning a major drug transaction later that evening — after the hearing. Boyle wants to just swoop in and arrest Dom now and not wait for the bigger supplier, but Jake disagrees. Even if it means they miss the hearing and the Nine-Nine gets shut down, they’ll end up taking down a bigger fish, which is for the greater good. They successfully take down the entire organization even though it costs them their chances at the hearing. While the team commiserates at the bar, Rosa comes up to Terry and tells him that he HAS beaten Hitchcock’s record if Terry counts all the cases he helped the rest of the team solve. Rosa starts listing off cases that wouldn’t have been solved without his input and it equals far more than Hitchcock has ever solved. This cheers Terry up immensely. Just then Holt walks in and announces that the hearing is over and the Nine-Nine will NOT be shut down. The city decided to close the Seven-Four instead because there was a surge of support from the community to keep the Nine-Nine open. Turns out this surge came from Gina’s “G-hive,” who called the commissioner’s office throughout the day, demanding the Nine-Nine stay open. And Holt surprises Amy with one more bit of good news: he only shared Volume One of his wisdom with her — there are still more volumes of mentoring to be completed. She couldn’t be happier.